Sharing our Menu Plan for March 16 - March 22, 2014. Stephen and I fell into the Target trap this weekend, going in for "only four things" but wound up walking out with more. It was supposed to be a simple trip to pick up some paper goods and hand soap, but we wound up picking up some new things for our bathrooms and a new reed diffuser for our living room. We didn't necessarily need a new reed diffuser for the living room, but we found ourselves in the candle aisle and couldn't help ourselves. Damn you, Target... Every. Single. Time. 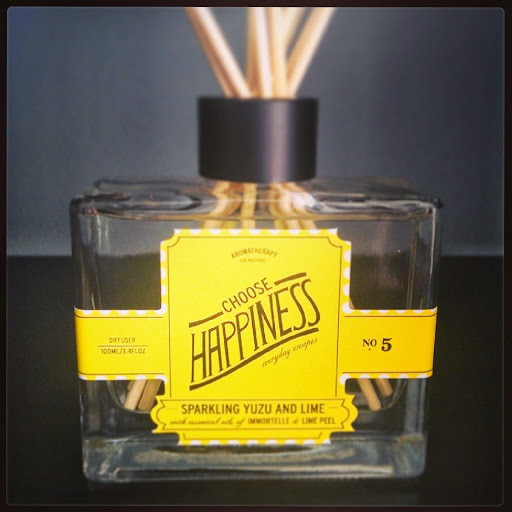 At any rate, our living room does smell pretty good right now, and I love the message on the bottle -- "choose happiness". It's a slightly unconventional vehicle for inspiration, but it's nice having a reminder to do that right out in the open. Plus, who could resist the cheerful yellow label on the bottle? One way I'm "choosing happiness" today is by getting back on track with my blogging schedule. The past week was horrifically stressful since I had multiple freelance articles due all at once (plus a few more to turn in over the next seven days). I had to sacrifice sleep when I was in the home stretch, so, of course, that meant I had no time to devote to blogging. I was supposed to have a BLAT for dinner last Thursday, but I was so focused on hitting my deadlines, I didn't want to stop to even make myself a sandwich. Instead, I relied on the leftovers we had in the refrigerator and a huge container of seafood chowder that I picked up from work. To make sure I won't waste the produce, I put the BLATs back on the Menu Plan for this week. Yes, I actually scheduled a "Date Night" on the Menu Plan this week. Stephen and I have been working ourselves ragged on our respective projects, and I think we deserve to have something fun to look forward to at the end of the week. I mean, as much as I love completely unwinding on Pizza Night, I think it'll be fun to dress up and go out for a change. Can't wait! What's on your Menu Plan this week?